I love the elegance of one color cards. Decided to make a couple myself yesterday morning. I wish the camera would of picked up the difference in color more to show you. Cards are the same design except for the type ribbon I used. Change out the sentiment to make it perfect for any occasion. Thank you Lin for allowing me to share your card today. I think the pearls are a great accent to the snowflake embossed image. 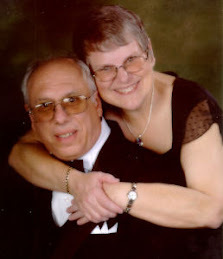 Lin has been a dear friend for many years, and a member of my KreatesKards Stampin' Up! team since September 2010. Happy Anniversary Lin. IMPORTANT NOTE: If you are receiving updates about either of my blogs, you will stop receiving them as of Friday UNLESS you go to the new site and fill in the "Follow Me" box in the upper right corner. Once you sign up, then you will receive an e-mail to activate. So why not take a moment now and update your e-mail notifications on my new blogs. It will ensure that you continue receiving my blog updates. Each blog is independent, so you will need to sign up for both if you want to receive updates from both. This is the replacement for this blog you are now reading (Stampin' Up! products, ideas, tutorials and so much more.) Be sure to sign up for e-mail updates on the new site. Remains the same ... this is the site you will order your Stampin' Up! products from me. This is the replacement for my Perfect Purse For You blog (Miche purses, videos, product information and so much more). Be sure to sign up for e-mail updates on the new site. Remains the same ... this is the site you will order your Miche products from me. This card could be used for any occasion. Like the one I showed you on Friday (my last blog post), this one also has the stampable cotton ribbon. I just used a different stamp in the set. I used Crumb Cake Cards Stock with Early Espresso Ink to create this card. I haven't added a sentiment yet, but think it will be a birthday card. The Daydream Medallion Stamp Set is a perfect match with the Floral Frames Framelits. Did you notice the ribbon? 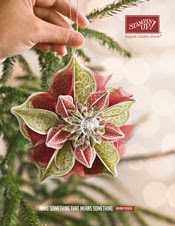 It is the new 7/8" Cotton Ribbon from the Holiday Mini Catalog. The ribbon is stampable. I used one of my medallion stamps, but you could use any stamp you wanted. I used our Classic Ink too. I was going thru some of my retired items the other day and came across this window sheet overlay (we no longer sell them). When I found it I knew it would be perfect for a birthday card I needed. I like the bright colors in the card. If you would like to know how to make this flower, I have a step by step tutorial HERE. I was playing around the other day with some of my leftover ribbon pieces. I had seen a similar bookmark in an Etsy Store a while back with a much larger paperclip. The bookmarks are easy to make. I took a larger paperclip, tied 4 different colors of ribbon (old olive, basic black, whisper white, and a Pink Pirouette. I actually knotted the riboon twice, then pulled together using a decorative brad. Be careful that you knot the ribbon on the correct end of the paperclip, otherwise it will not slide onto the book page to mark your spot. Thought they would make great small gifts, stocking stuffers, or a just because gift. You can find extra-large paperclips at most office supply stores in packs of 10 if you want a larger paperclip for the bookmark. Supplies Used - Click on photo for larger view. Mary Terlizzi and I have known each other for over 5 years. Four plus years of those, she has been my upline (supervisor) for Stampin' Up!. She is such a wonderful friend, and a very talented individual. I have been the recipient of many of her wonderful cards. The one above "Patchwork Quilt Card" is one that she created for my Stampin' Up! KreatesKards Team September Card Swap. If you would like to know how to make a similar card, I have a tutorial on my blog HERE. Thank you Mary for allowing me to showcase your beautiful card today. If you like digital design, you are going to love the latest My Digital Studio 2 downloads. You can view them HERE. This card was created using scraps of card stock, glimmer paper that I had on hand. When I put the red and blue card stock together, it reminded me of a night sky. Then the butterflies and stars had the sparkle and shine. Just a fun card to create, and a great way to use leftover card stock. Each package contains 2 sheets that are 12 x 12. The heart was created using the Heart Collection Framelits, item #125599. Butterflies were punched out using the Elegant Butterfly Paper Punch, item #127526, and the tiny stars were punched out using Punch Pack called Merry Minis, item #126882. Click on photo to enlarge the view of it. As kids head back to school, Stampin' Up! is going back to "spool"! During September, get a FREE spool of 3/8" Stitched Satin Ribbon with every $40 purchase (before tax & shipping). Choose from any of our 2012-2014 In Colors - or earn all five! 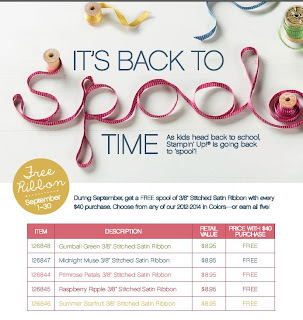 Each spool of ribbon is a $8.95 value. 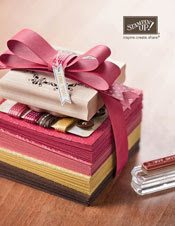 This promotion has no limits-for every $40 you spend, you'll get a free package of 3/8" Stitched Satin Ribbon. When you order on-line thru my website, after you enter your purchases then enter in the item numbers for the ribbon on the same screen. If you forget to add them in to the order, the system will prompt you to go back and add them in. Stampin' Up! did this really funny video about this promotion. Hope you enjoy it.